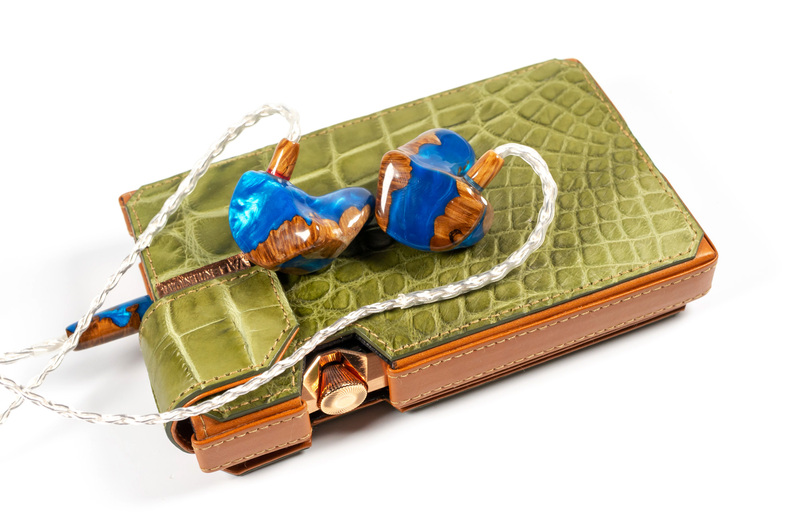 Is it possible to be crowned this coveted title in this saturated sea of custom in ear monitors? Well, if you asked me this question in the past I would have shouted a resounding “No way!”, however that might all change with the arrival of the AM7 from Ambient Acoustic. Read on to find out . So who is Ambient Acoustic? 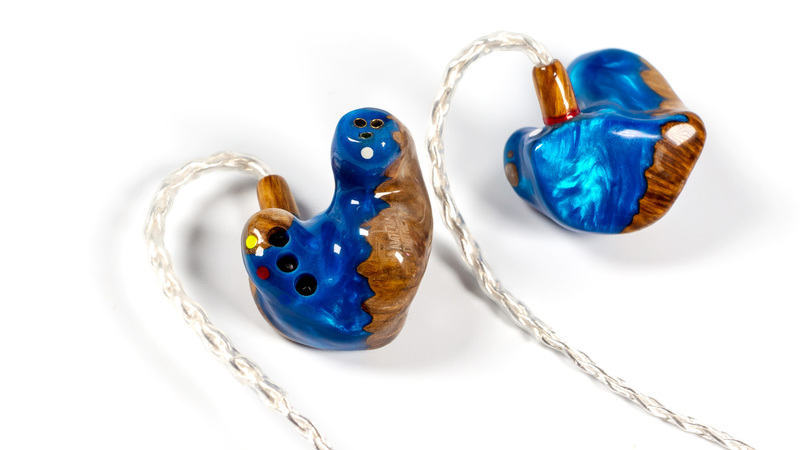 Ambient Acoustic is a company based in Ukraine who has been constantly churning out custom in ear monitors since 2009. However, they are not known globally or at least on head fi, as based on my understanding, their transition to the international market just took place recently with the first deployment of an English based website. 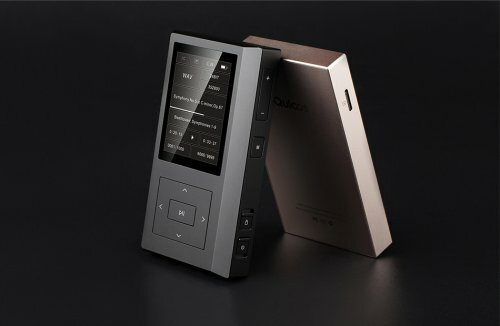 In fact, most of us me including, were not aware of this company until I read a review of the AM7 by Headfi user “Cleg”. Cleg’s comprehensive review piqued my interest so much that I had to contact the great people at Ambient Acoustic to purchase my own AM7 for a review. Click on this link: https://ambient-acoustics.ua/eng/naushniki-dlya-audiofilov/ambient-acoustics/am7-lam-s.html to access Ambient Acoustics English website. So after contacting the kind folks at Ambient Acoustic via their Facebook page (yes, they speak English there), I was given instructions on how to submit an order on their website. 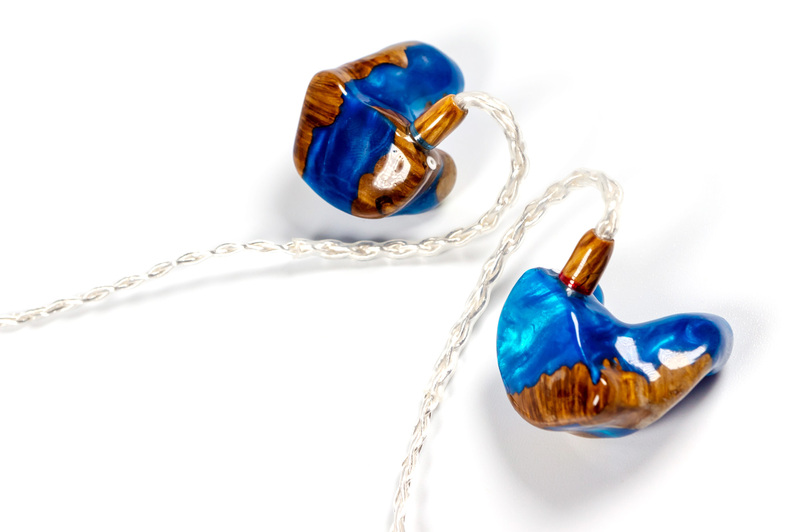 Ordering from the website was a simple process as the designer for the IEMs was designed to be pretty user friendly. 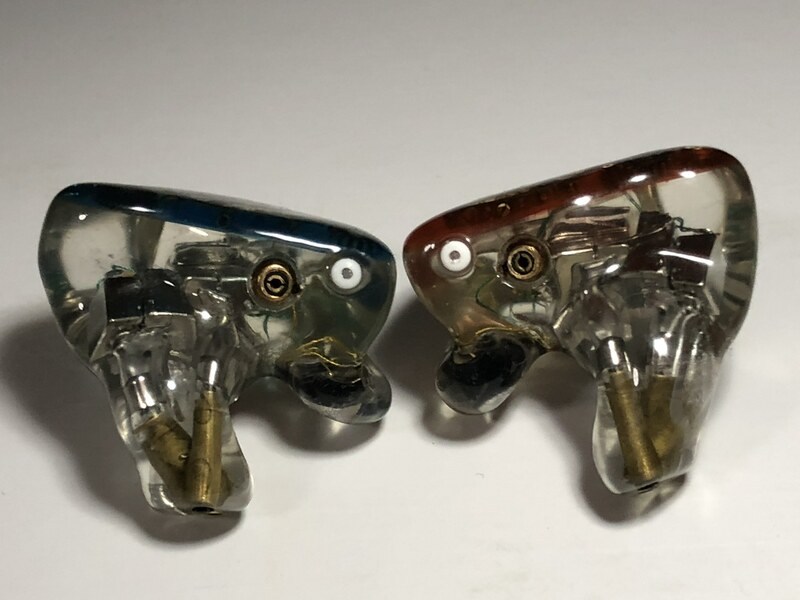 You can choose the various colors for your monitors, faceplates etc and your selection will be shown in a preview window as like other IEM brands. However, if you have already browsed through Ambient Acoustic’s Instagram, you would have noticed that they have more material choices available that might not be on the designer page, this can be rectified by communicating with them on your choice. 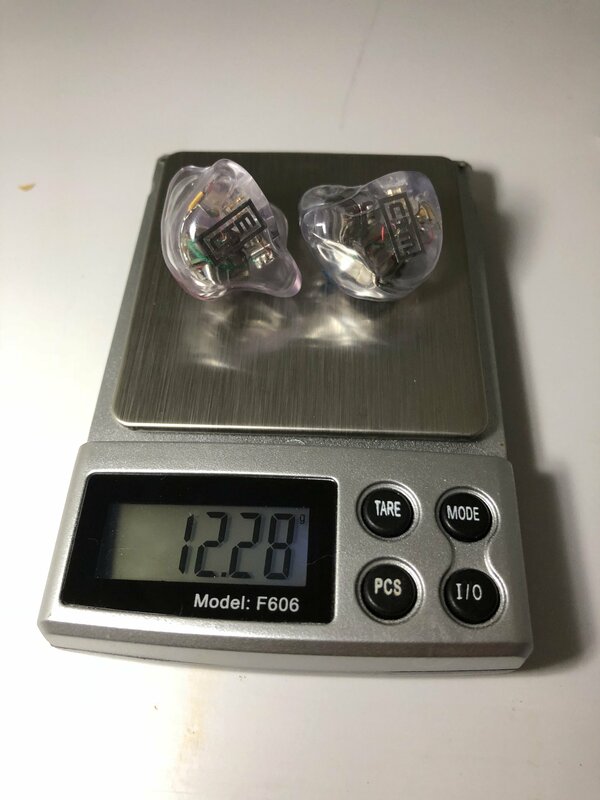 Once the order is completed, the staffs from Ambient Acoustic will then contact you to request for either your 3D ear impression STL file or instructions on how to ship them your custom ear impressions. Payment process however, can be a little tricky since I was told that PayPal was not an option in Ukraine and they only accepted payment via Payoneer which to me was a slight hassle as I had to create a new account just to pay for my AM7, a slight hiccup in the otherwise smooth ordering process. 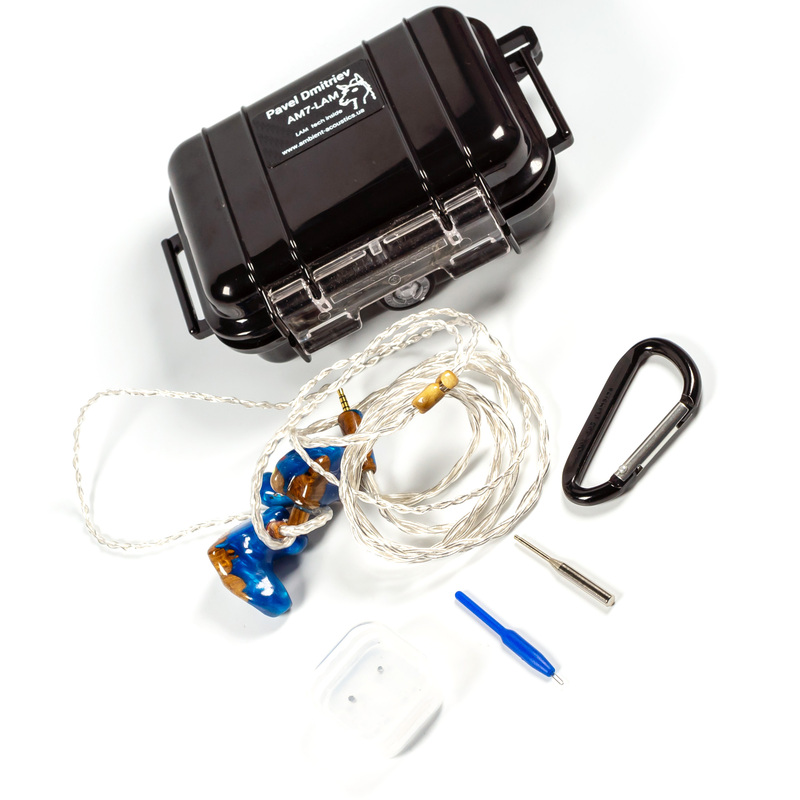 That said, you will still be able to configure the type of cable connection you want and Ambient Acoustic will be able to provide you with the preferred termination since they make all their cables in house. 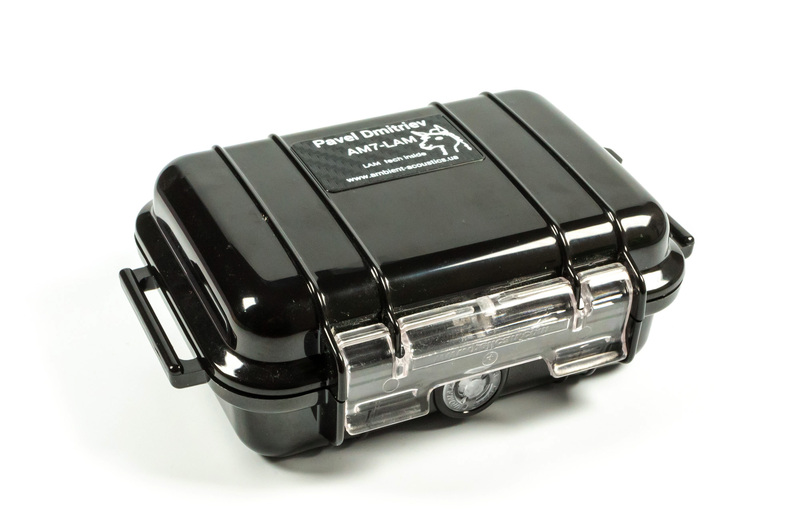 Ambient Acoustic’s packaging for the AM7 is pretty standard, it comes with a standard Black Pelican case with your name and serial number embossed on the top. Opening it reveals your beautiful IEM in the middle, a desiccant box, a mini screw driver, cleaning brush and lastly a plastic box containing 2 set of treble filters. The AM7 came pre-installed with the white treble filters and you can change the filters out by unscrewing them with the provided screw driver. 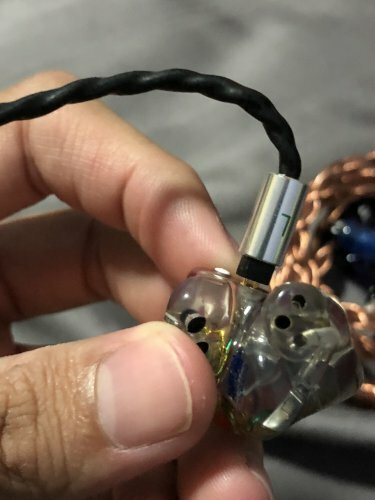 The quality of the AM7 to me is no doubt the best out of all the IEMs I currently owned. 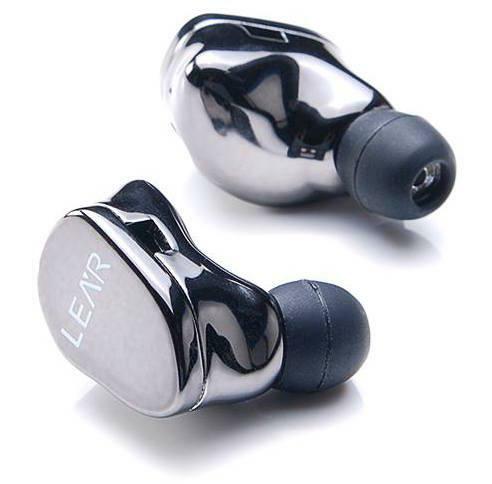 It is a solid filled 7 BA IEM with 3 sound bores and uses a 5 way passive crossover design. 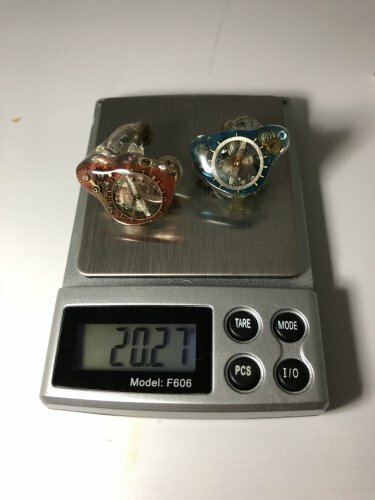 The AM7 weighs a hefty 20.27g as compared to the other hollow core IEMs such as Zeus (Empire ears) 12.36g and the CT500 (Cleartunes Monitor) 12.28g. 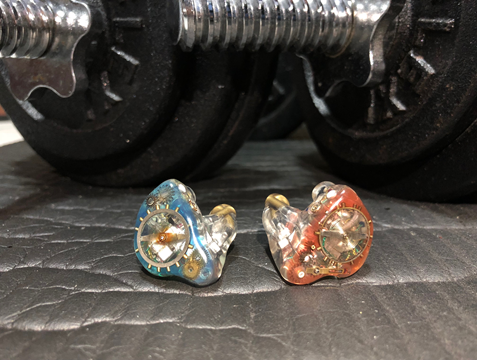 However, even with the increase in the weight, when placed in the ear, the IEM fits comfortably and seals completely without causing any much ear fatigue. AM7 is packed with several special features. 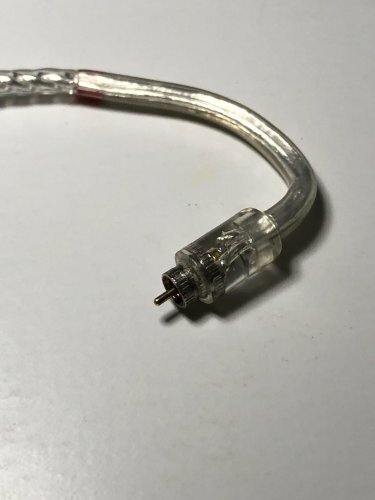 One of the most unique and the one that caught my eye was the special proprietary cableconnector to the IEM. Instead of using the traditional way of 2 pin or MMCX connection, Ambient Acoustic came up with their own iteration of the connection, and that is via the use of a single pin and a screw on configuration. Removing and reconnecting the cablenow is so much simpler as all you have to do is unscrew the connector and pull the cable out. Gone are the days of loose sockets and broken pins. However, that said, even though Ambient Acoustic had adopted their own propriety screw on connector, they understand that audiophile around the world like me and you probably own a few dozen of cables with the 2 pin connector, hence for all the Custom version of their “Live Acoustic Mod” (LAM), AM7 including, will come with a special connector built into the IEM themselves which accepts both the proprietary connector and also ANY of the 2 pin connector you have. This feature totally works and I was also able to test AM7 with my other cables. The second feature that the AM7 has is the LAM. 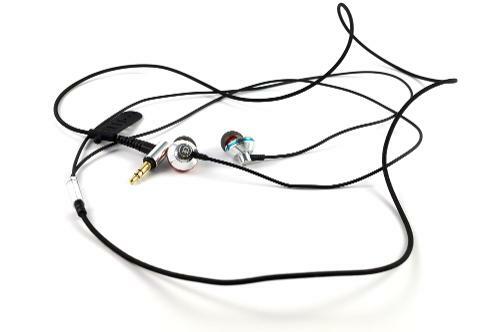 The LAM system allows the user to tune the frequency of the IEM based on the music or location they are in. 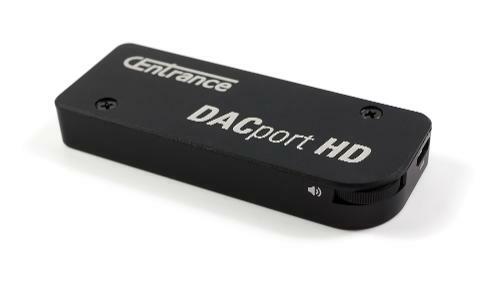 Users have the ability to manually adjust the low frequency in 4 increments, 0, +6dB, +10dB and +14dB, and also the vocal zone by 0dB and +5dB. 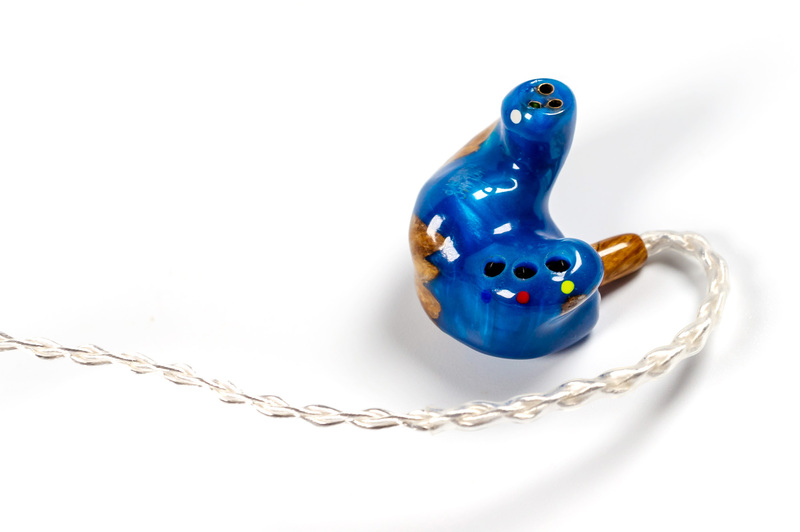 This adjustment is done via the use of the switches on the IEM. Based on this theory, AM7 can in fact be tuned to have 8 different sound signature! More on how the different adjustment affects the overall sound signature can be found in the SOUND IMPRESSION section below. Now moving on to the most important part of the review. How does the AM7 sound? Treble for the AM7 in the flat settings is sparkly airy and clean. It extends very linearly with no exaggeration especially for the super high frequencies. Female vocals are able to reach their full vocal range without sounding sibilant or harsh. High hats sounded natural and not synthetic. The only complain I had for the treble in the flat settings is that it lacks a little of the extra oomph/energy at the top most frequency resulting in a slightly less satisfying feel when listening to certain vocals heavy songs. Bass for the AM7 is considered to be a surprise for me too. 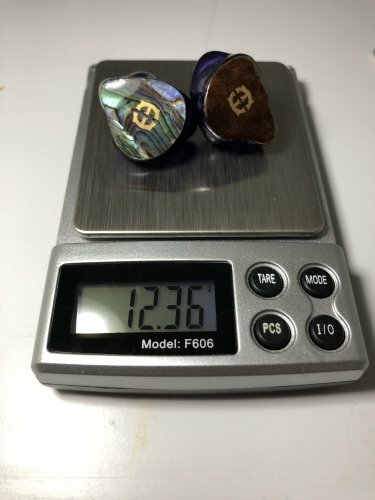 Coming from 64Ears A12, I have always thought that there will not be any BA IEMS that can give me the perfect accurate bass that A12 was capable of. But boy, was I so wrong. The bass from the AM7 is punchy and fast. The decay is also satisfyingly quick and clean. Nothing sounded bloated. In addition, the bass reaches all the way to a very low frequency and each beats comes with a satisfying gut pounding “Thud”. Bass quantity is always sufficient yet never overpowering. Guitar strums and cello plucks gives off a satisfying “twang” and provide goosebumps inducing vibrations. The speed of each beats is also fast and very lively and I find my toes tapping along to all sorts of music. It is just that fun. AM7’s soundstage to me is sufficiently big yet not overly wide. It is warm enough to provide an emotional rendition of vocal heavy songs yet airy enough to listen to poorly mastered pop songs. To put it to perspective, the soundstage seems to give you a sense of illusion that you are perhaps at the second row of a concert hall. But as mentioned previously, the soundstage could perhaps extend more at the top to give the sound an extra energy and sparkle. AM7 sounded quicker and more balanced than CT500. Bass quantity and texturing sounded better on the AM7. 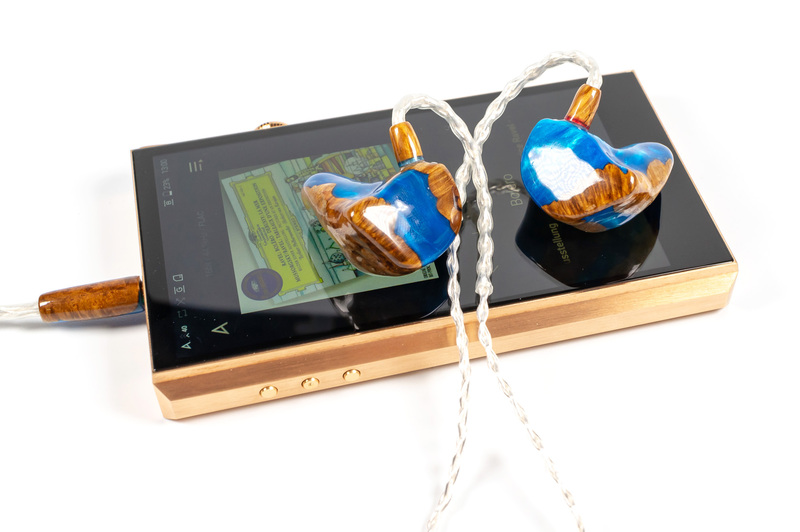 Vocals is pretty similar for both IEM however, AM7 has a slightly brighter tone as compared to CT500. 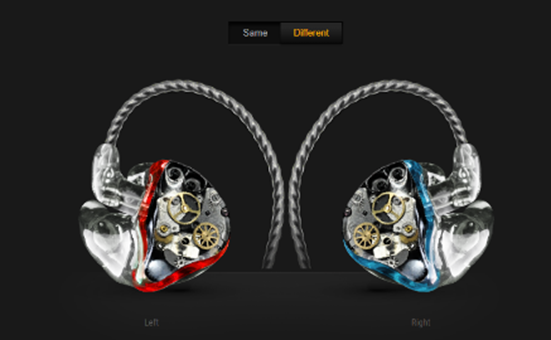 Consequently, CT500 also stood out against AM7 with a crazy detailed layering and separation of notes. As of right now, nothing beats CT500’s layering and separation, even with a slightly congested soundstage, CT500 provides a superior separation of instruments as compared to AM7. However, when listening to pop songs or poorly mastered tracks, AM7 provides a better rendition of the song as its wider soundstage provides a more spacious medium for the very complicated mesh-up “mess”, wherelse CT500 will sound bloated and messy. Even though AM7 bass sounded really good, I will still have to choose A12 for its bass. The Adel/Module (mine was from Kickstarter) really did provided a much better bass texturing and layering. Mids wise, there is not much contest here, to me I have always felt that A12 lacks the magic in its Mids department, female vocalist sounded boring and lifeless. On the other hand, AM7 is lively and fun. Soundstage for both are equally on par however A12 might have a slight advantage due to the Adel port as it gives A12 a slightly more realistic soundstage. Now for most who knows me, I am a huge fan of Zeus’s vocals. It is just so creamy smooth and emotional. However, AM7 is still able to compete with Zeus for the best vocals. It reaches the same peak and smoothness as the Zeus but falls short of the Zeus weighty feel to the vocals. This is actually a good shortfall as it resulted in AM7 being more versatile as compared to Zeus. During a vocal heavy song, Zeus wins hands down for providing that raw emotion, however for other songs that is not vocal-centric, the lightness of AM7 notes will result in a much superior sound signature. Red switch down, Blue and Yellow switch up. (+6dB low freq, +5dB vocals). This was the configuration suggested to me by Ambient Acoustic when I asked them what will be the best configuration if I am listening to mostly female vocalist. Lo and behold, after trying this configuration for a full week I can say that this is the configuration that I will stick to and be happy for the rest of my life. Remember how I mentioned that the treble extension was a little cut off at the top in the “Flat” settings? With the +5db in the vocals (Mids), this “flaw” has been resolved, now female vocalist soars with power and energy albeit sometimes sounding border lining sibilant. I like this extra oomph but it might be too “hot” for some to handle. With the +6dB to the low frequency, bass quantity did indeed increases. Texturing and detailing of the bass remains as before, however I was able to notice a slight but noticeable increase to the impact of each bass beats. Sound stage however took a little beating to the width, but this was compensated with a higher height and greater depth. All this points to a warmer and more intimate sound signature which is to me the “Holy grail” of how vocal-centric music should sound. Now with this configuration, the sound signature changes most drastically as compared to the “Flat” setting. Vocals became more recessed and further from the central stage. Instead of being at the second row of a concert hall, now you are at the middle row of the hall. Vocals sounded distant and lacks the energy. However, separation of instruments became much more apparent, and more details can be heard effortlessly. In addition, the bass quantity also increased to a large extent yet never bloating the entire sound signature. To me this configuration is the best if you are singing live in a concert or if you are doing live monitoring. The sound signature reminded me of how Empire Ear's ESR sounded like. AM7 to me is considered to be a highly versatile IEM. Its “Flat” setting is versatile enough to listen to all types of genre. Nothing sounded bloated or exaggerated. It is fun, lively and very enjoyable. With the implementation of the “LAM” technology, users can experiment with the sound signature as and when they like thus increasing its value. In addition, the ability to use the proprietary cableconnector and the standard 2 pins connection gives it an extra star too. With a price of 1050 USD, the AM7 is indeed providing more value than it actually cost. In conclusion, is the AM7 a Jack of all Trade and Master of all? I will say that it’s almost close enough but not yet there. It will be interesting to see how Ambient Acoustic can continue to improve the AM7 for its future “LAM” series! Nice review, thank you. 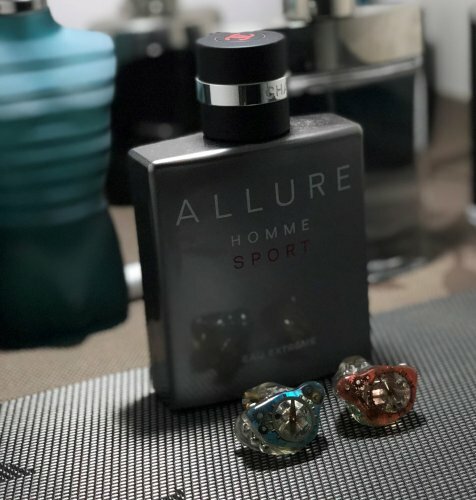 Allure Homme Sport and Mont Blanc Legend: you're a man of taste. Many years of friendship connects me with Ambient Acoustics Laboratory from Kyiv. Once upon a time, I've started my journey to the world of customs with their 4-driver model AM4. Then it was upgraded to 6 drivers, to 10… Once you get locked into multi-driver CIEMs, the tendency is to push it as far as you can. 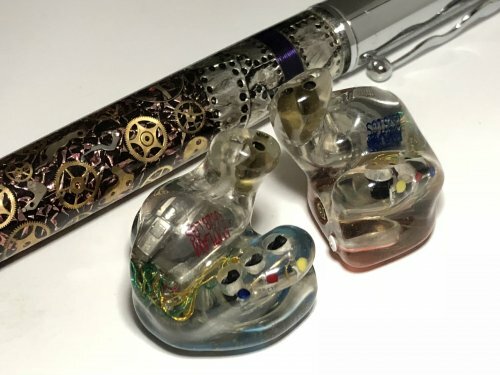 As usual, the primary audience of the laboratory were professionals: musicians, singers, sound engineers, but about two years ago, AA created the unique line of IEMs, dedicated to music listening enthusiasts. This models gathered all existing "know-how" and added a new feature called "Linear Acoustics Mod" — special crossover toggles, allowing sound tuning. That's actually why new models are called LAM: LAM3, LAM5, and LAM7 (I think you can easily guess the number of drivers in each model). After little thinking, I've decided to downgrade my AM10 Special Edition to LAM7. Of course, word "downgrade" is just a joke, often less is even better, but it's a matter of separate discussion. Like almost every other model in AA lineup, you can get LAM7 in custom ($1150) or universal body ($1050). Custom's price includes free steampunk design (yep, you know — all that gears and springs on the faceplate) and a wide selection of color options, as well as different other design options: carbon, metallic faceplates, glitter, full-colored images, etc. Recently, laboratory purchased and mastered 3D milling machine, so now your customs can be made of different types of premium plastic and exotic woods, this cost additional $300, but I think it's worth that price, I think after seeing photos in this review you'll agree with me. 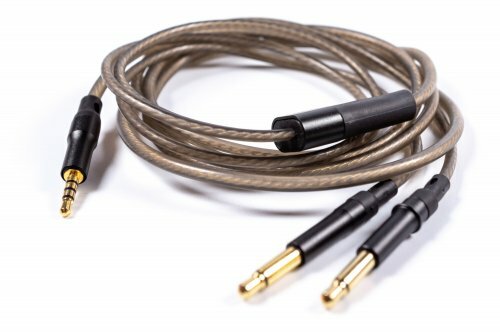 Ambient Acoustics also offers a vast selection of cables with different termination options. Stock version is made "in-house," it's done to match a general design of your shells and uses proprietary screwing connectors. I like those, as they are secure and reliable, but you can ask for a regular MMCX/2 pin. 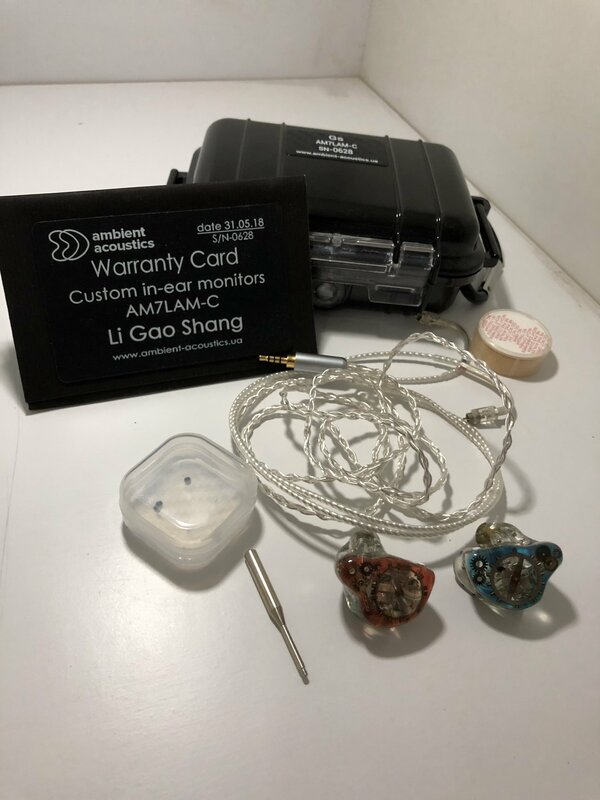 Traditionally, IEMs came in the hard plastic case, besides earphones and cable you'll get dehumidifier pill, cleaning tool, two sets of treble filters and a tool for filter replacement. 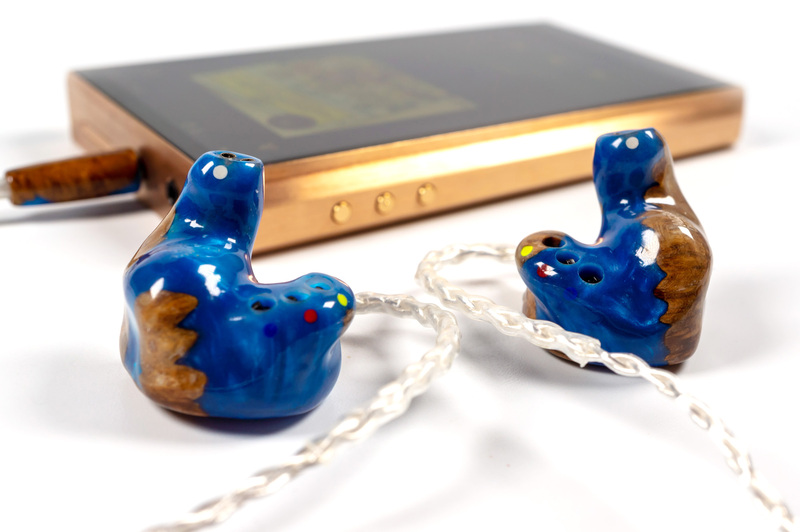 Design-wise, LAM7 are typical custom IEMs, tailored precisely by your ears impressions. Spouts have three bores, two with metal tubes inside (for better mids and lows representation) and one without (this one is where the treble filters go). The comfort of wearing and sound isolation is typical for customs, in one word — they're superb. The stock cable is soft and reliable, so concerning design and build quality, everything is top-notch. 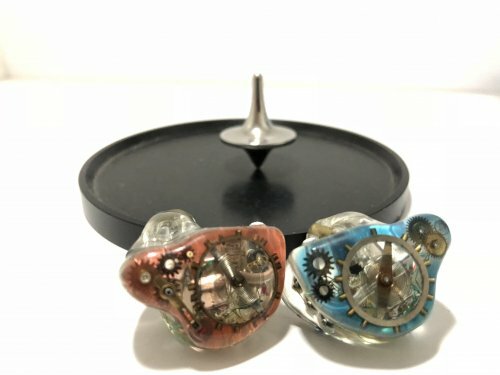 One of the most exciting features of LAM's crossover design is unique technology, used for phase and impedance correction, this allows to lower source's impact on IEM and achieves better sound even with high impedance source. So, as I've mentioned before, the sound is tuneable. By default, with all switches off, LAMs have the almost linear frequency response with a slight accent on treble, unevenness of FR is about 12 dB. Using acoustic filters, you can tame it a little bit with white filters or even further reduce treble with green ones. You can select amount of bass (0 dB, +6 dB, +10 dB, +14 dB) and also you can boost mids area (approximately from 250 Hz to 3 kHz). So, you'll get 24 different tuning options. Most probably, you won't toggle them always, I've ended up with the following tuning: +6 dB on lows to add a bit more warmth, mids boost and white treble filter. So, further sonic description is for this tuning. TL;DR Organic representation with natural mids, deep, punchy lows and a big imaginary stage. High resolution, but not too clinical sounding. Nice treble extension. Bass is almost close to perfection. Lows use double acoustic filtering, without constraints in the electrical crossover. That allowed more linear phase of lows and better shaping of bass speakers "responsibility area." So, lows here not only have great punch and texturing, but also stays perfectly in place, even with +10 dB boost (but with +14 dB option it can bleed a little bit on mids in bass-heavy tunes, but it's almost unavoidable). With bass tuning options you can select necessary amount of weight with beautiful precision, but with any of options, you'll have great rumble and sense of realism. Mids are almost neutral with default tuning and get a pleasant forward signature with switch toggle. In the vast majority of cases I prefer a small boost here, it makes a vocal sound more forward, with a bit of added emotions. It's also the perfect option for heavy music connoisseurs, as it gives a subtle hint of added aggression and drive. LAMs aren't digging too deep in micro contrast, avoiding being too thin and clinical, instead of providing a great sense of solidity. All instruments have a realistic body, and vocal sounds emotional and lively. The imaginary stage is excellent, it's a bit bigger in width, then in depth, but anyway, layers separation is superb. For the first revision of AM7-LAM, my central claim was the treble, I've missed some additional accent on treble, as Ambient Acoustics tried to make a model that will satisfy both treble lovers and treble haters. Now, this problem was solved, as you can get as much treble as you'd like. No-filter version of treble is fun: crisp sound, with highlighted treble attacks and perfect layering. But this tuning is a bit "too much" even for me, so white filter is just what I need: more than in previous revision of LAMs, less than in the non-damped version. So, in this case, treble is perfectly balanced (at least to my tastes), bit on dryer side with great attacks and a bit shortened decays, good layering and separation. An extension is also excellent, without roll-off on the upper treble. 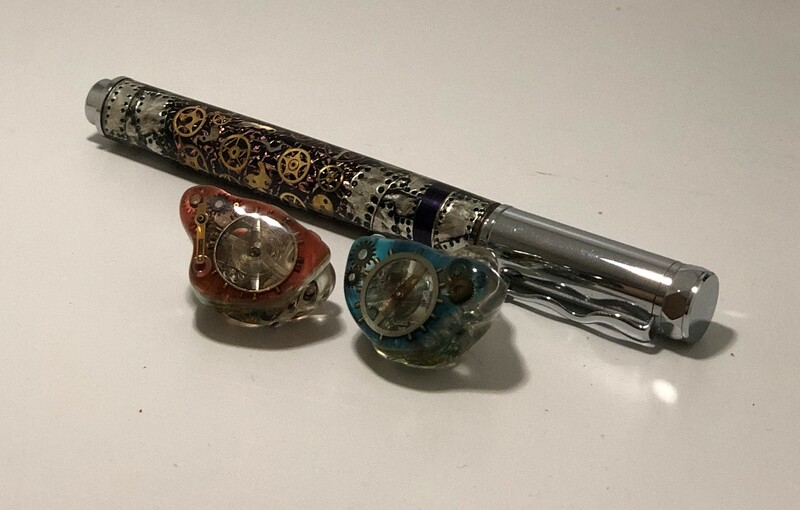 As for comparisons, currently I own two models of the same level that can be compared with LAM7, it's Campfire Andromeda and Noble Kaiser Encore. To get the sound close to Andromeda's, you need to toggle all switches off and use the medium treble filter. In this case, Andromeda is more resolving on mids, while LAM7 offers more realistic lows, a bit politer treble and more body on mid. Regarding speed, Andromeda is a bit better, and also provides the deeper imaginary stage (not much, but anyway). For tonality, close to Kaiser Encore you'll need to add +6 dB on lows and use the medium treble filter. Kaiser sounds more full-bodied than LAM7, with more bass resolution and more natural mids. Upper frequencies are almost on par with a bit different approach: LAMs are dryer, while Kaisers are a bit more energetic. I also own few other flagship models (CA Vega, Hum Pristine, 64Audio U12), but they are different, and I don't see much sense in comparisons of entirely different IEMs. Well, it looks like I have to write some conclusion. So, if you're looking for CIEMS that are close to TOTL, but priced much more reasonable, Ambient Acoustics LAM7-C is an option to consider. They offer lots of exciting features, sound tuning options, great design and, of course, rich and engaging sound. natemact, hungryewok, Lucif6r6th and 8 others like this. how would I go about ordering one like that ? a wood and resin shell ? shenanbay, you'll need to contact AA directly using one of possible ways: https://ambient-acoustics.ua/11/eng/index.html (email, skype, contact form or social networks), as premium designs isn't available in constructor yet. Also, please note, my version isn't resin, it's a compound acryl.